Credit: CBS TelevisionRhoda (Valerie Harper) and Phyllis (Cloris Leachman) visit Mary Tyler Moore at her office in the last episode. When I heard that Valerie Harper was diagnosed with incurable brain cancer and had only months or weeks to live, I did what any friend would do. I went to see her. Well, not exactly. I drove to the house that Mary Richards and Rhoda Morgenstern lived in on The Mary Tyler Moore Show. 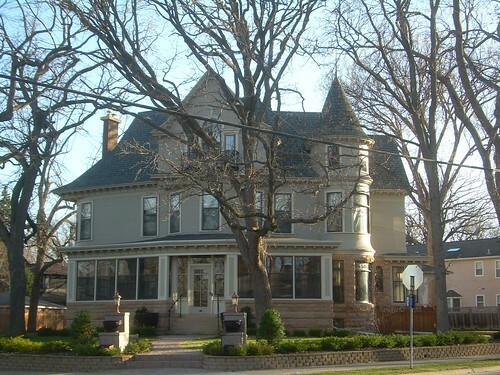 It’s a grand, Queen Anne Victorian in an older, upscale area of South Minneapolis. I have lived in the Twin Cities for several years now, but never visited this landmark, which has been on my list of things to do. The house is privately owned and there are no tours. As curious as I’ve been to drive by it, I've never felt the urgency to do so. It’s like not having visited Alcatraz when I lived in San Francisco, or the Statue of Liberty during my years in New York, or the Freedom Trail in Boston, my previous residence. But this was different. I needed a tangible way to deal with the awful news. When I Googled “Mary Tyler Moore house,” a photo of it appeared, along with the address, 2104 Kenwood Parkway. In The Mary Tyler Moore Show the fictitious address was 119 North Weatherly. The sitcom was filmed in a Los Angeles studio. But its exterior establishing shots were of this ornate Victorian. I don’t know my way around Minneapolis very well, so I printed out directions on my computer. On a freezing afternoon this week I got in my car and headed out. The house is located in a beautiful neighborhood, just a block from Lake of the Isles, on a street lined with maple trees. This time of year the lake is frozen and the tree limbs are bare. I recognized the house instantly, even though it’s now painted yellow instead of white. Its sweeping front porch gave it away. Snow covered the grounds. I parked across the street to get a good look. Mary supposedly lived on the third floor. Her apartment was easy to spot with its tall Palladian windows and iron-railed balcony. I could just picture the inside wall with the initial "M" hanging on it. Rhoda lived in the attic. I’m guessing her apartment was in the windowed, round turret. The 9,500 square-foot house used to be divided into apartments, just like in the TV show. It has since been reverted to a single residence — and there's a for-sale sign in front. The asking price is $2.895 million. If Mary Tyler Moore was America’s sweetheart, then Harper was America’s best friend. She was everything a BFF should be: Loyal to a fault, overly generous, bluntly truthful and very entertaining. It was always Rhoda who could rally Mary’s spirits when she wasn’t feeling her chipper self. She was the kind of friend who would tell someone off if they didn’t treat you right and would bring you meals if you were ill. Like most BFFs, she and Mary had occasional feuds, but always made up. The Mary Tyler Moore Show ran for seven seasons (1970–77), but Rhoda wasn’t around for all of them. In 1974 Harper became the star of her own spin-off sitcom, Rhoda. Harper is so identified with the flamboyant, big-hearted, self-deprecating character that the public's had a hard time accepting her as anyone else. Over the last week the actress has been on The Today Show and Piers Morgan to talk about her diagnosis. At 73, she still looks just like Rhoda. All that’s missing are the colorful headbands. Just as Rhoda used her wit as a defense, so does Harper. She doesn’t cry or feel sorry for herself, at least in front of the world. Harper joked in this week’s People magazine that while Rhoda was always on a diet, her doctors are encouraging her to gain weight. “Men have never said that to me!” she told the publication. Like Rhoda, Harper remains optimistic and still finds hope. Despite her grim prognosis, she has opted to undergo chemotherapy with a drug that has limited success in killing cancer cells. “I have a fighting chance until I’m gone,” she told People. Rhoda used to make the impossible happen. I vividly remember the episode of The Mary Tyler Moore Show where she made her best friend cry by surprising her with a yellow Mustang convertible, all paid for. Maybe it’s Harper’s turn to receive a miracle. After some 10 minutes of observing the house, I decided to head back home. It was dark now. I hadn’t traveled but a few blocks when I turned my car around. I wanted one last look at the familiar Victorian. Suddenly the lights came on inside. Mary's apartment — or the room where it was supposed to be — was lit up. In my mind I saw Rhoda dropping by for a cup of coffee and a chat with her best friend, Mary. It was my way of saying goodbye.